Slowly we're reaching the end of the journey. 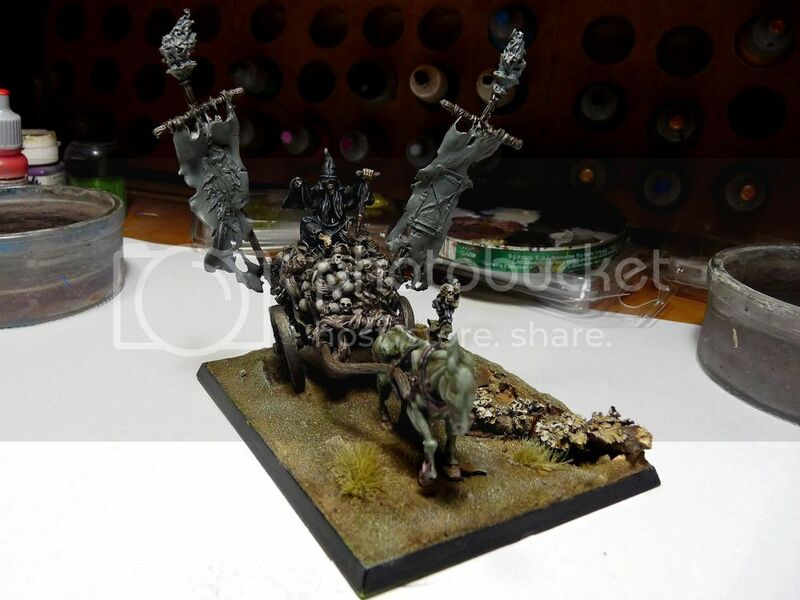 Working on the cart main structure was hard - not mentioning problems with manipulating based model it was simply boring: there's lots of skulls and bones to paint. 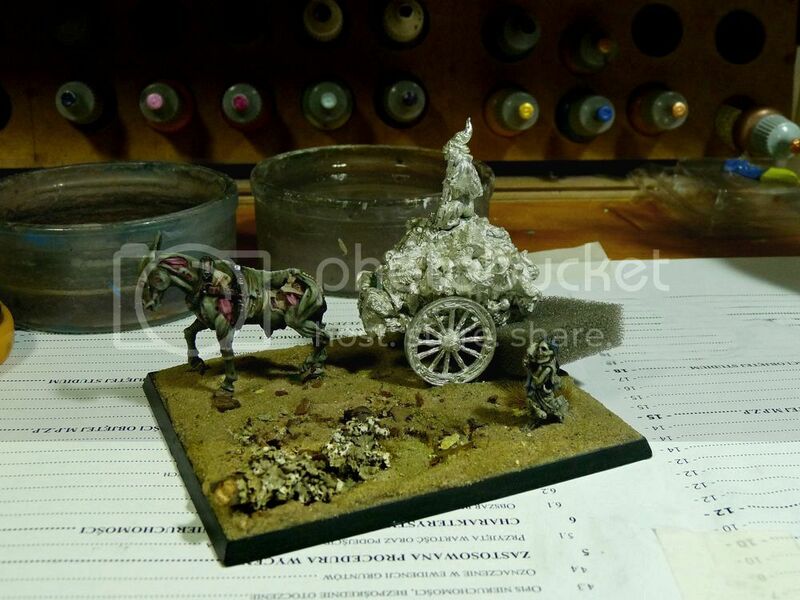 I decided to paint the cargo with dirty tones - browns and chalks were addsed to glazes and washes to make the thing look natural (as much as natural pile of remains can be that is). 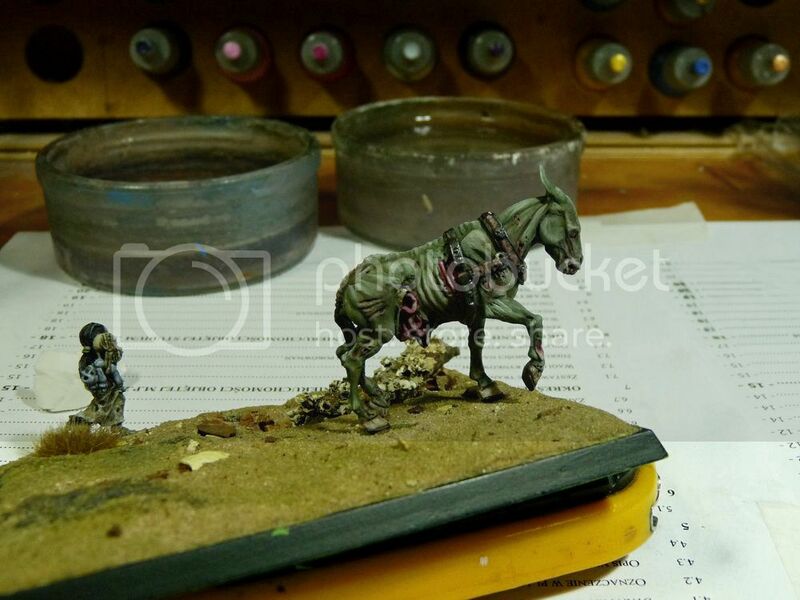 Same chalks were added for shading wooden and metal elements - such thing makes the piece look coherent. 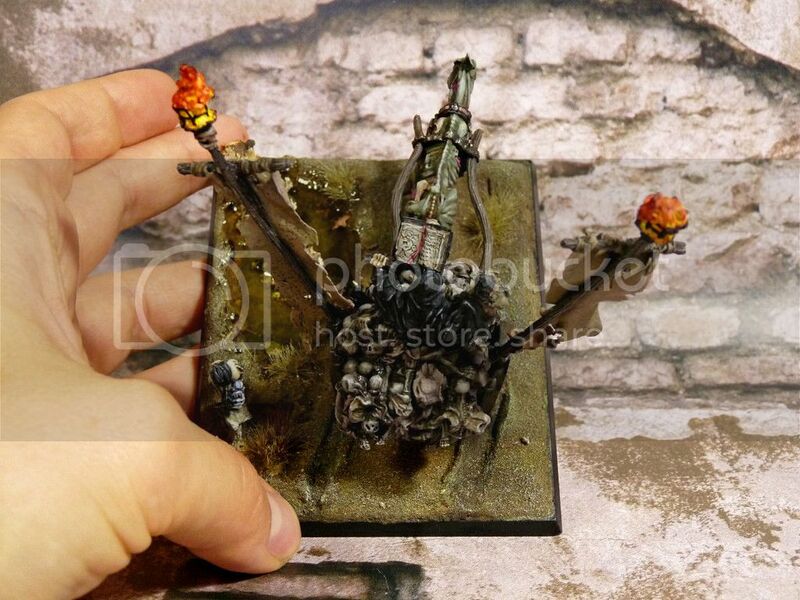 At this stage lich is not much more than some rags and handful of bones so it was painted black - the dark cherry on Nagash's birthday necro-cake. I thought that should make it pretty eyecatching - dark character sitting on a top of much brighter bones. The banners will also be bright - no idea what tone at this moment though. 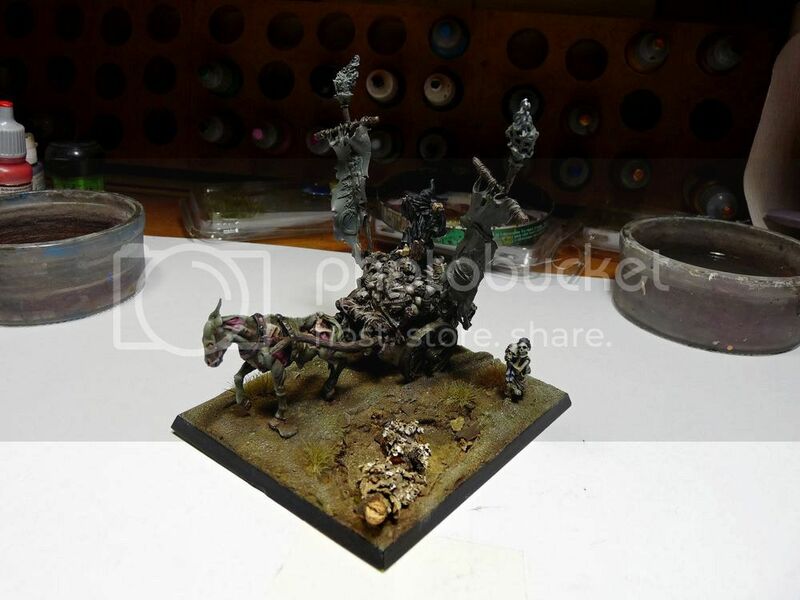 As mentioned above model was attached to the base - lots of greenstuff was put under wheels and to connect cart with the horse, but it was absolutely necessary. It is supposed to be gaming model and because of nature of the sculpt - solid pinning was not an option. 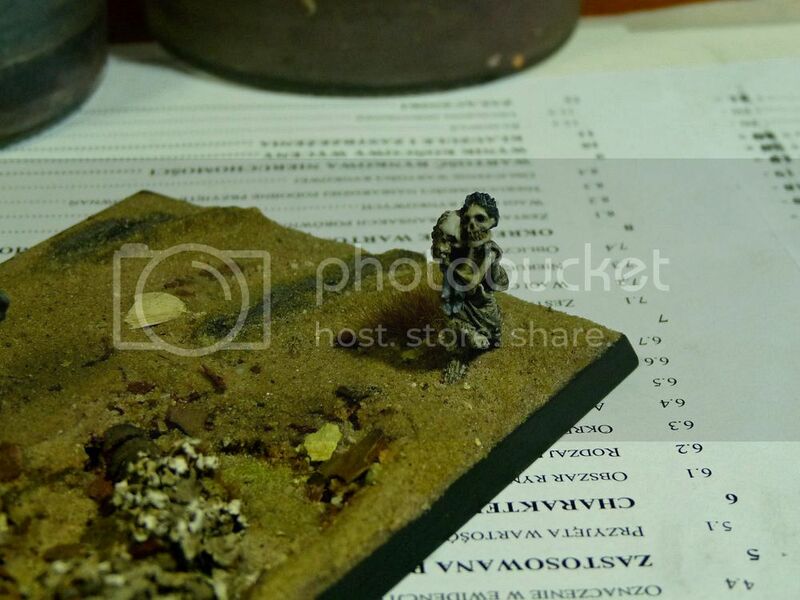 The base itself is just sand washed with browns and olives and then drybrushed with bright olive and bleached bone. there will be artifical water in the hole but it's the very last step. I will also sprinkle some dirt / mud but again - whole thing must be painted first. 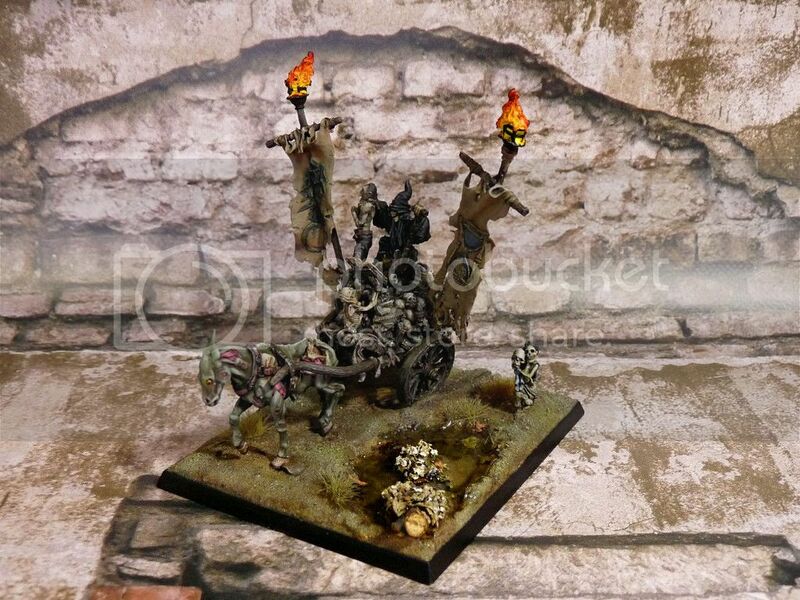 Apart from basing there is a zombie which lich is raising from the deaders pile (no idea what's he doing actually, I know he's grabbing zombie's neck), there's a skeleton holding ye magick booke (I will paint it nice and clean, dry bones - better contrast with rest of corpses) and of course: banners. Frankly I wouldn't mind if those were just stripes of leather (maybe something like Lichemaster's cloak) but banners with sculpted patterns should also look decent. 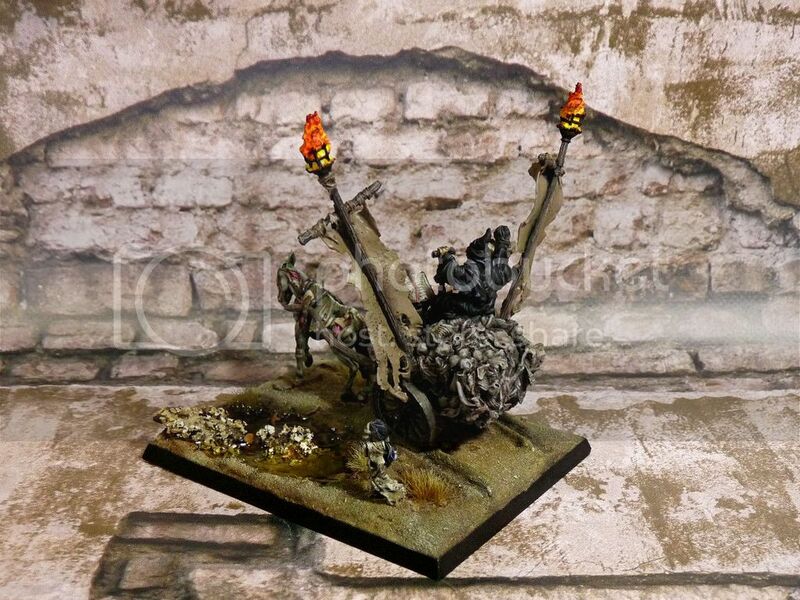 I think I will paint them like rotting flesh - that should look striking and make the rider even more visible. Deeply hope the next post will be the very last about this case. Hey again, the painful adventure continues. 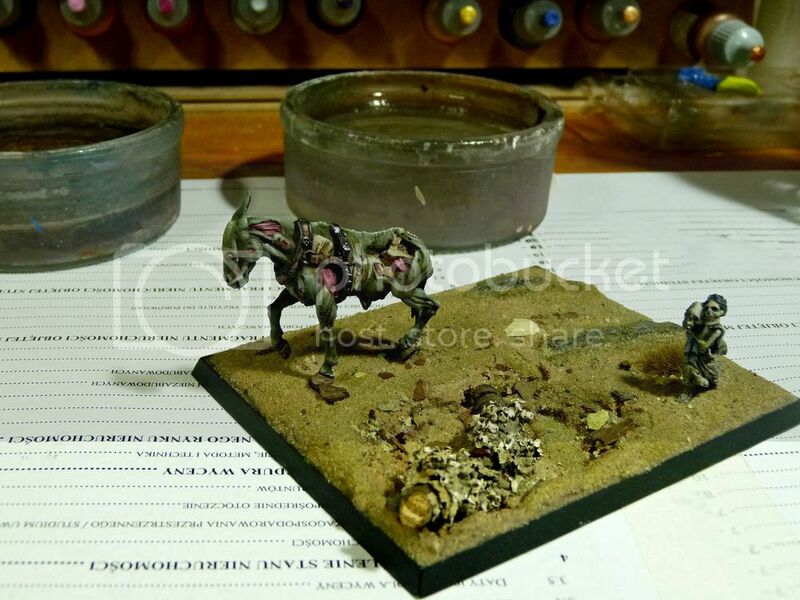 Since the last time I managed to slap some paint on the lil' skellie and the pony. That doesn't seem to be much but this model doesn't want to cooperate at all. There are minis you enjoy painting and there are the others. 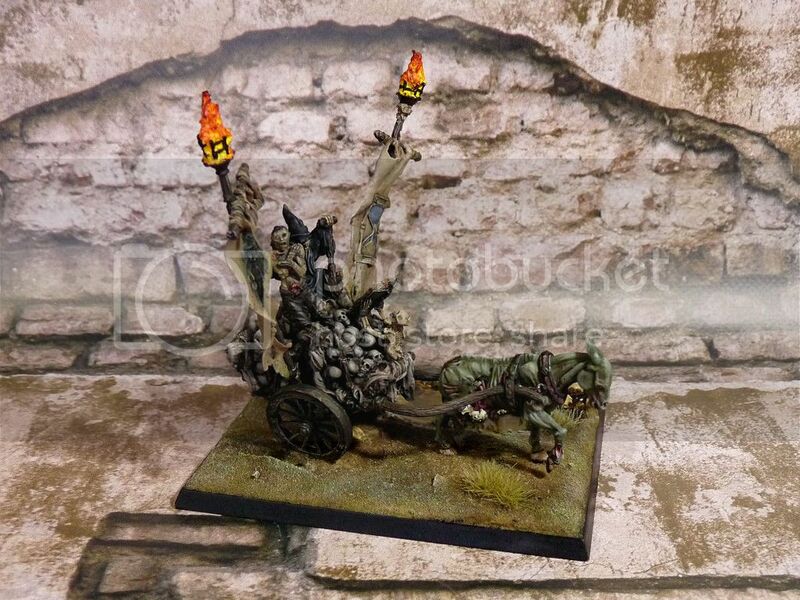 Chariot of the Harvester is one of the others. Since there was not much painting there cannot be much babbling (this time). it's very delicate - there's lots of fine details. There's also creepy bit - the skellie is carrying skeleton-ragdoll on it's right arm. There was more fun painting the pony. It was painted with olives and some broken reds for the contrast. 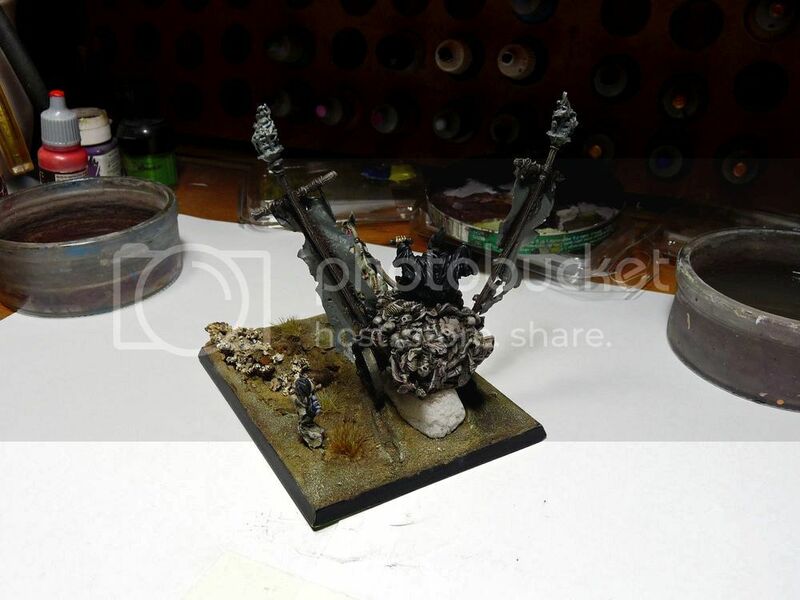 It turned out rather bright but that should contrast nicely with dark base and dark chartiot frame. This sculpt is very delicate - it's legs are so raw-boned I didn't dare to pin them. Instead I glued bars (or whatever the proper name of those bits of metal under minis feet is) straight into base. 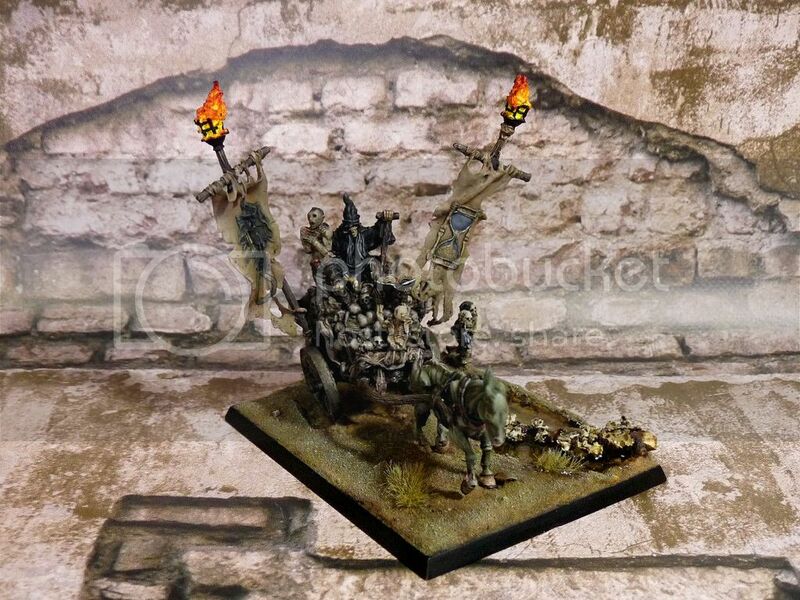 Model has already been varnished but I am planning to sprinkle some mud on it when the chariot is ready. Maybe not as much as on my Gone muddin' painting challenge entry but there still should me lots of mess. Ok, pics time. And speaking of rotting ponies - clicky! And that's how big the thing will grow. It will be more impressive because of large banners on each side. Really cannot wait to see it done... No more Gamezone. Speaking of which - I should have spare GZ knight (a'la EE Empire / Bretonnia) if anyone needs.